I had a very short-lived career as an interior designer — it was great until I discovered that making it my job sucked all the fun out of it for me. But I still love design, and I’ve amassed hundreds of magazine tear sheets over the years. I store them in plastic sheet protectors and file them by category into three-ring binders. Call me OCD, but they’ve been a great resource – not just for me, but for friends, relatives and even the occasional client. Although the color is arresting, it was really the fluid, incomplete circle that pulled me in. 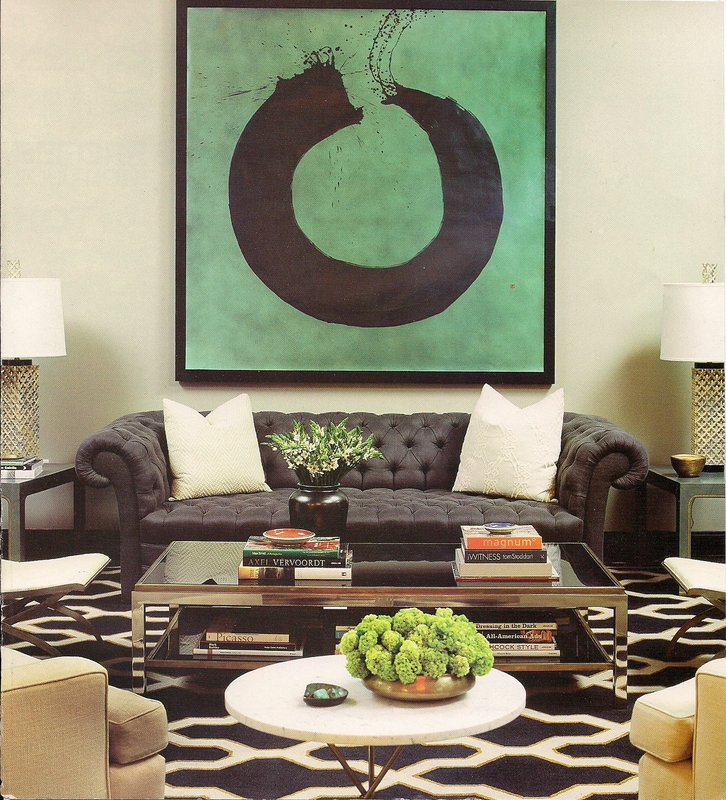 The room was designed by Kelly Wearstler, who commissioned the painting — Drip Circle — from artist Mario Uribe. After some research, I learned that the circles Uribe paints are a type of ensō, a symbol commonly found in Japanese calligraphy and one of the most prevalent symbols in Zen art. As I paged through the rest of my (10!) binders, I found more rooms featuring ensō-inspired artwork. I love so many things about this room — the cool, silvery gray walls and Roman shade; the warm golds; the pops of green; the twig chandelier; the natural elements — all anchored by the fabulous (and huge!) abstract ensō painting. I clipped it almost nine years ago, but it still feels just as fresh and relevant today. 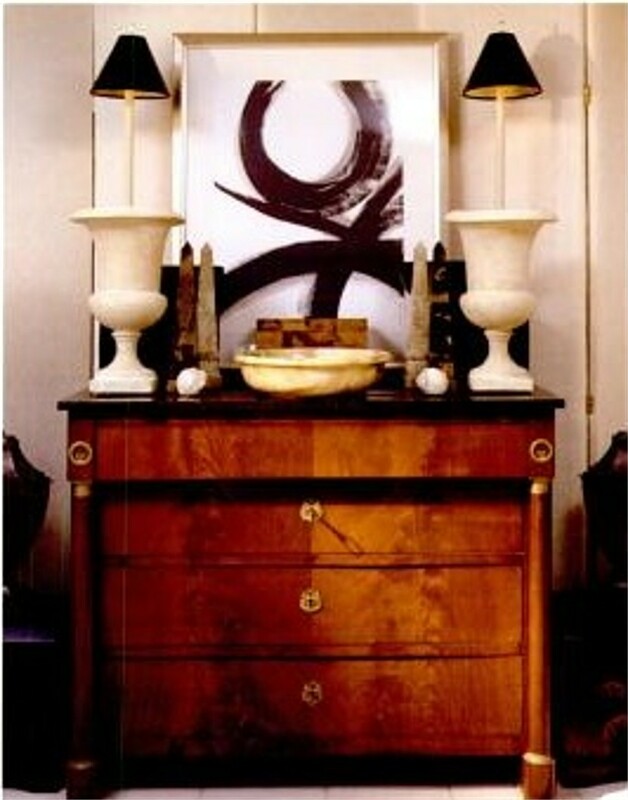 Another abstract ensō by Charles R. Aber anchors this entryway. Designer Juan Montoya says of this painting, “It gives the room scale. Everything was designed around it.” Love how he used the single, graphic textural pillow on the humongous sofa. This room, by Trading Spaces designer Doug Wilson, features a painting he “swiftly executed” for the space. (To me, it’s a split ensō.) I also love the orange tissue paper-covered walls. The abstract ensō painting helps give this room its Asian vibe. I like the strong visual contrasts and how the colors in the painting are repeated throughout the room. 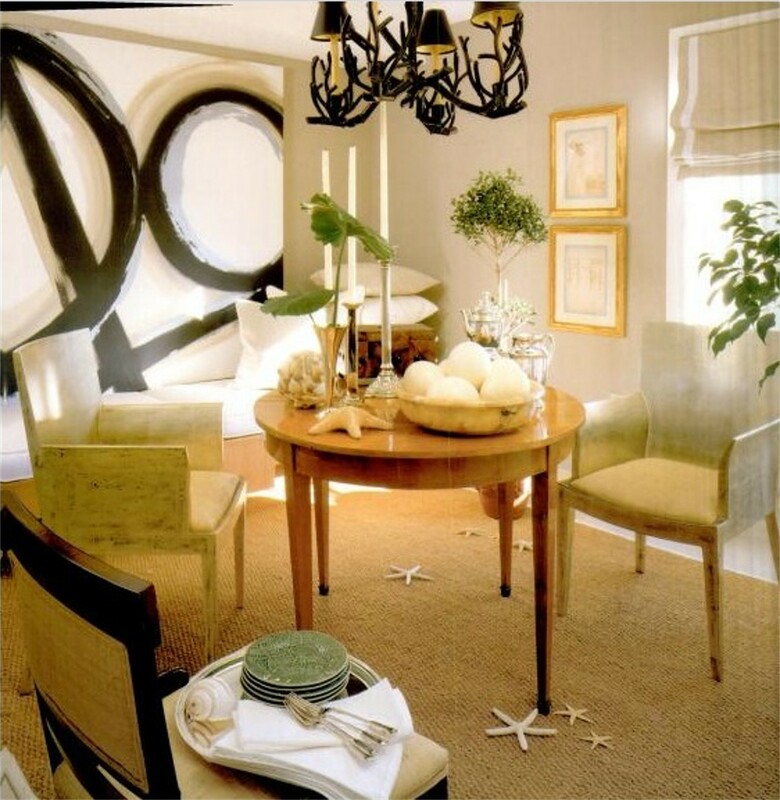 I originally clipped this room for the Poulson Artichoke chandelier and Christian Liagre chairs; now I notice the art and how it mimics the table shape. Update to original post: Just came across this ensō by artist Hyunmee Lee featured in the Fall 2011 Utah Style & Design magazine. Love how well it complements the fiddle-leaf fig, wood, and other modern and organic elements in the room. Inspired by my tear sheets, I bought a book to learn more: Ensō, Zen Circles of Enlightenment by Audrey Yoshiko Seo (she’s also the source for the Wikipedia article). It features more than 50 examples of ensō created by monks — and a nun – complete with background stories and interpretations. The way ensō is drawn — whether the circle is complete or has an opening, whether it’s done in a single brushstroke or several, whether it’s a perfect circle or more of an oval — is also supposed to reveal all sorts of things about the artist. After reading the book, I bought some Japanese calligraphy brushes, ink and art paper. While living in Japan, I’d learned how to write the basic Japanese calligraphic syllables – hiragana and katakana – so I already knew how elemental characters were formed. How difficult could it be to draw a circle with a big, fat paintbrush? As it turns out, quite difficult. I wanted my ensō paintings to look like those in the book — or the magazines. But they were lumpy or oval or incomplete. I started to worry about what my imperfect attempts revealed about me, my character, and my mental and spiritual wholeness. These worries were quelled a bit after I found this wonderful video clip on Mr. Uribe’s site wherein he describes how he came to do what he does. One of the things that struck me most was his description of American art versus Asian art. So that’s why I decided to kick off this post with the lumpy, clumsy ensō I painted yesterday. Although I was sorely tempted to keep re-doing it until I had a better one, I followed Mr. Uribe’s advice: I did it and I accept it. Tomorrow I may make a better one, or maybe I won’t. Perhaps I’ll not even try. I still have a long way to go before achieving spiritual and mental wholeness. But with ensō — and with life — I’m finally coming to understand that what really matters is that I’m progressing, and the honesty and integrity with which I approach the journey. A brush. I use a set of bamboo calligraphy (or sumi-e) brushes I picked up at Hobby Lobby. They are also available online at dickblick.com. I’ve found they’re the best for achieving an interesting “point” at the starting and stopping points of the ensō. But truthfully, any brush will do — I have also used watercolor brushes, an angled trim brush and even (in a pinch) a kitchen basting brush. They all work for achieving different, interesting effects. Paint or ink. I like to use sumi-e ink because it’s thin and easy to work with, but it’s generally waterproof and NOT recommended for young children (or your sanity). Watercolor paints work well for little ones. I’ve also used acrylics and craft paints. Paper or canvas. Because I tend to use water-based paints and inks for this project, the paper matters. For my “daily practice” I’ll often just use printer paper — which tends to wrinkle after drying — or a sketch pad I keep just for enso painting. But if it’s something I want to make more permanent, I like to use special paper created specifically for sumi-e. The only drawback is that it runs about $15 for 20 sheets, so it makes me more nervous about “messing up” which is sort of the opposite of why I’m trying to do it in the first place. Special thanks to Mario Uribe, Kelly Wearstler and all the other artists, interior designers and authors who introduced me to ensō — before I even knew what it was. Sharing this post at Centsational Girl’s Paint Projects Party. ← Got $3? Get this sweater. Energizing and peaceful at the same time. Really great post. I love the room and art by Charles Aber. Do you have any more information about him? Thanks Kimberly. Sorry — no more info on Mr. Aber. I looked for a website but could only find a book published in 1998 that says he lives in Florida. If I find anything else, I’ll add it. Thanks for the enlightenment and education. I never ever heard of Enso. I love yours. Especially after you explained it, so honest and forthright. This is a very cool post. And by the way, I bet I can make that pillow, but I’ll warn you right now, fur/leather don’t inhale and exhale the way fake fur fabric ones do. When your head or arm rests on them, they fight to keep the air inside. 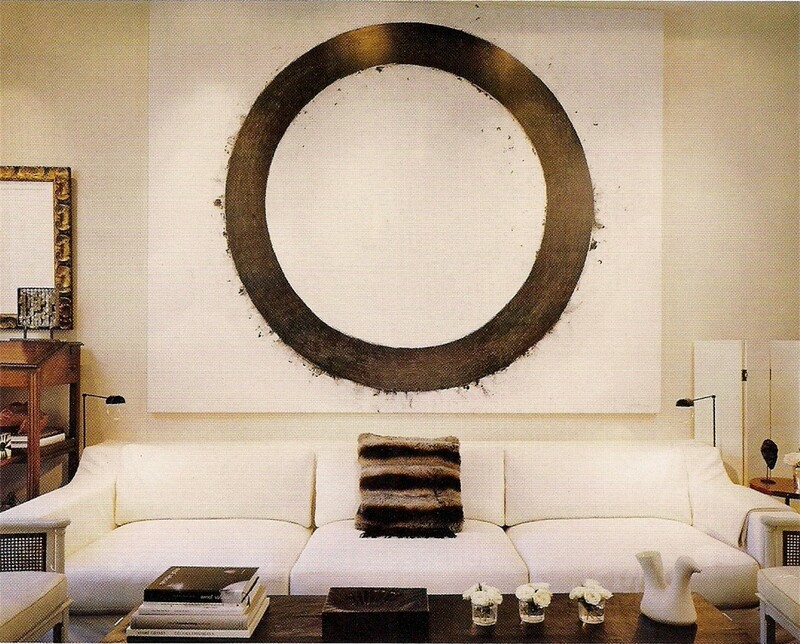 In the name of all that is peaceful, I hope that fur pillow under that enso painting is FAKE. I just signed up for your blog. I also did a short stint as a designer and have a tear sheet collection that you would appreciate. I discovered 7 ensō paintings in my collection. I teach Art and English at a private school for learning disabled teens. I am always looking for great ideas. My students will love this project. I will send you photos when they are done. Thanks! Fun that we were both collecting ensō art without realizing it. Thanks for sharing! I had no idea what the enso was either. I love the incomplete circle – thank you for the enlightenment and education. I really love this and can’t wait to try to paint one myself!! So glad you stopped by, Angie. Just a note of caution — once you start painting them, it’s hard to stop! I have always admired this art and from time to time have attempted to do it. Perhaps I will take another go at it. Thanks so much, Rashon. 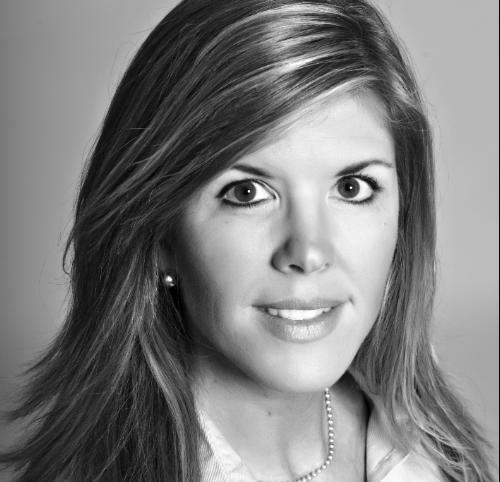 And congrats on the feature in House of Fifty — with your design talent, I’m sure your enso will be perfectly … you. As for my thrift store find, he recognized it and the artist and noted that it was part of a calendar, but a calendar that was exquisitely made and given to someone important. The image was valued at about $75-100, but that was unframed. We love its simplicity and its power. Great story, Ross — love it when a thrift store find proves valuable as well as meaningful. Thanks for including the link to Robyn’s site, too — the “New Year Enso” is a fave. I LOVE this — thanks so much for all this info about them. Didn’t really know what an enso was. So happy you enjoyed the post, Arianne. Once you know what enso is, you’ll start to see it everywhere!